Who's the monster in your closet? Ask "yes" or "no" questions to reveal your monster! There’s a monster in your closet. Can you figure out which one? Ask “yes” or “no” questions to narrow down the possibilities. When you think you’ve figured out who’s behind the door, take a guess – if you’re right, the door will swing open to reveal your monster! 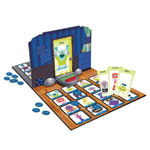 Featuring all your favorite Monsters University characters, it’s monster-finding fun! Welcome to Monsters University! There’s a Monster behind your door, can you figure out who it is? 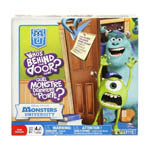 Become a top student at Monsters University by using “yes” or “no” questions to reveal which monster is behind your door! Who’s Behind The Door is great for every Monsters University fan but is made for 2 players ages 6+. Discover all your favorite Monsters University characters in this fun loving memory game!